Fog in the Mountains, Day One | NJNA is Blogging! My third class at seminar this year is “Fog in the Mountains,” a wonderful jewel of a piece taught by Gail Stafford. 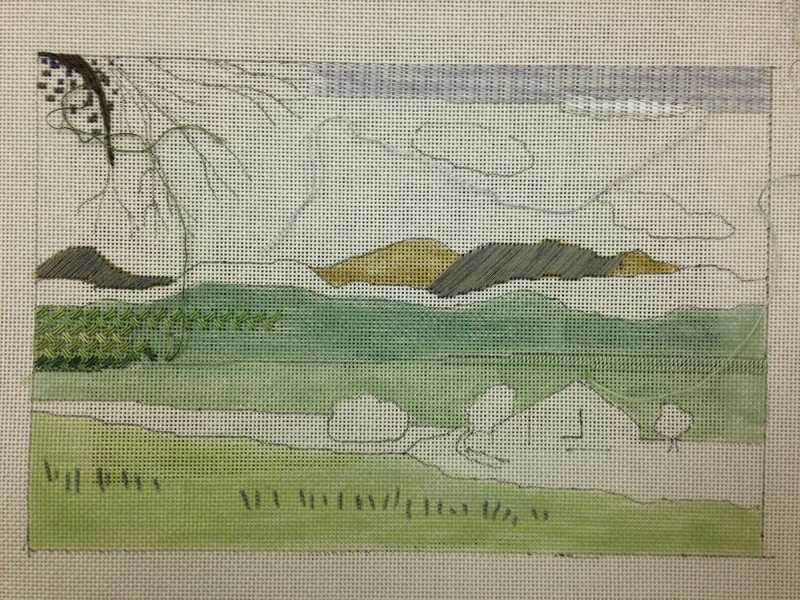 The piece is on Congress cloth, and much of what we’ve stitched so far has been with a single strand of overdyed floss. So the stitching is delicate, much of it over painted areas. Gail painted a couple of sections for us in advance, but we had to paint the others — after having two separate classes that involved painting, any intimidation I might have felt about it is gone. I’m hoping that this means that I will try my hand at designing and painting my own canvas at some point during the upcoming year. I already have a couple of ideas! You are brave to paint! I look forward to seeing your designs. Your work looks great. I’m impressed. Maybe you can inspire others in our chapter to give it a try; maybe you could teach us a bit of what you learned.